A vascular sonographer or technologist performs non-invasive diagnostic examinations of the arteries and veins of the body. It is important that your sonographer is credentialed. A sonographer can be credentialed through Cardiovascular Credentialing International or American Registry for Diagnostic Medical Sonography. A credentialed sonographer satisfies certain educational standards within the profession and they have passed exams to test their knowledge and competency. 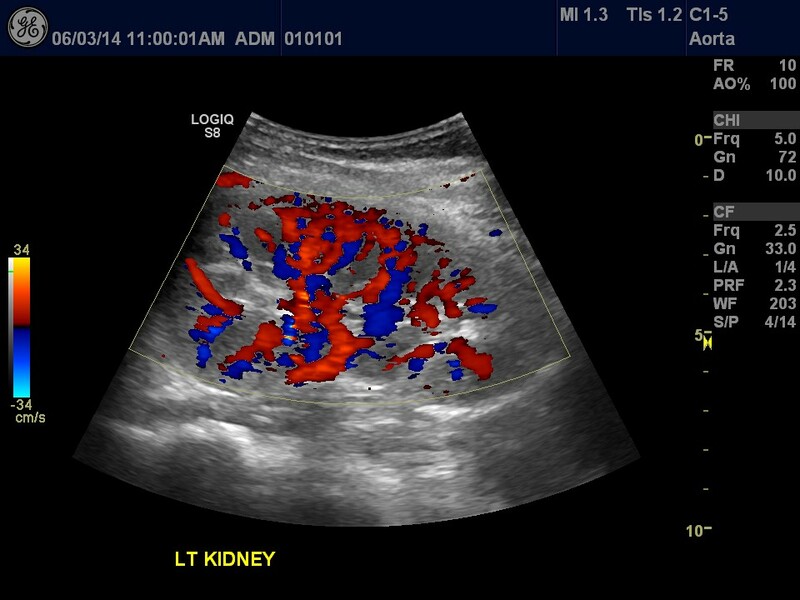 Ultrasound (sonography) is a medical imaging modality that uses high frequency sound waves to create an image. Sound waves are safe and do not contain harmful radiation. Sonography is divided into several specialties including obstetrics, gynecology, abdomen, echocardiography (heart imaging), musculoskeletal and vascular. 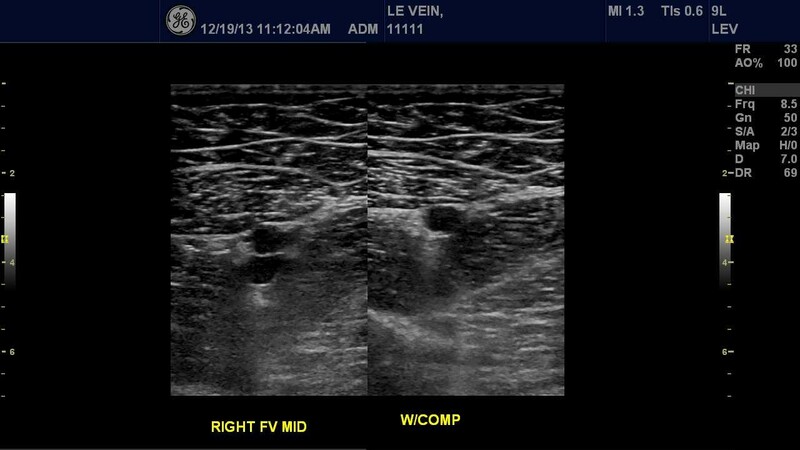 Vascular ultrasound is the specialty that interrogates the arteries and veins of the body. 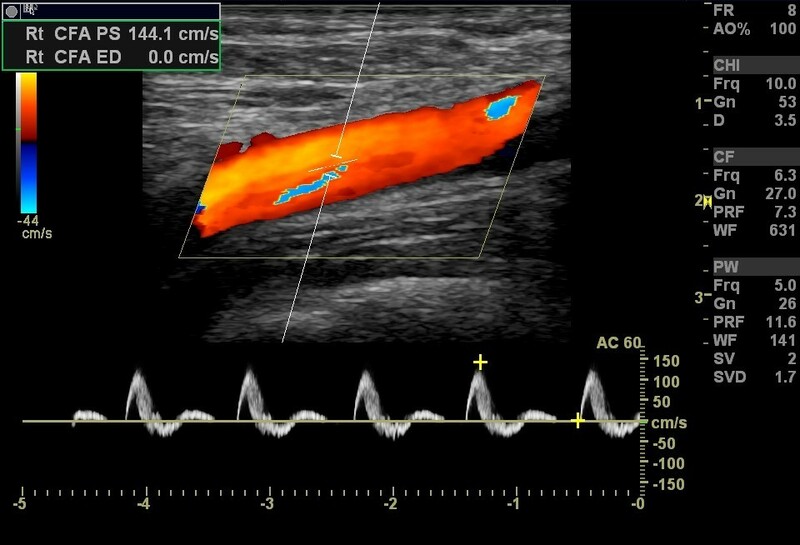 Combining ultrasound imaging with Doppler ultrasound technologies allows the vascular technologist to evaluate and record blood flow characteristics dynamically in real time. The veins carry deoxygenated blood from the limbs, organs and brain to the heart. When the sonographer examines the arteries going up the neck and into the brain. This includes the innominate or brachiocephalic, subclavian, vertebral, common carotid, internal carotid and external carotid arteries. When the sonographer assesses the large artery in the abdomen that carries blood from the heart through the abdomen and into the legs with diagnostic ultrasound. Diameter measurements are taken to screen for a dilatation in the vessel wall, also known as an aneurysm or for follow up on a patient with a known abdominal aortic aneurysm. When the sonographer assesses the main arteries leading to the kidneys and the kidney tissue, ensuring there is adequate blood flow. When the sonographer assesses the patency of the blood flow in the arteries that feed the digestive system. When the sonographer assesses the arteries in the arms and fingers. Segmental blood pressures can also be taken in the arms and fingers to assess patency. When the sonographer assesses the arteries in the legs. Segmental pressures and pulse volume recording can also be included. The common iliac, external iliac, common femoral, superficial femoral, profunda, popliteal, anterior tibial, posterior tibial and peroneal arteries are typically assessed. When the sonographer assesses the veins in the neck and arms including the internal jugular, innominate, subclavian, axillary, brachial, ulnar, radial, cephalic and basilic veins. 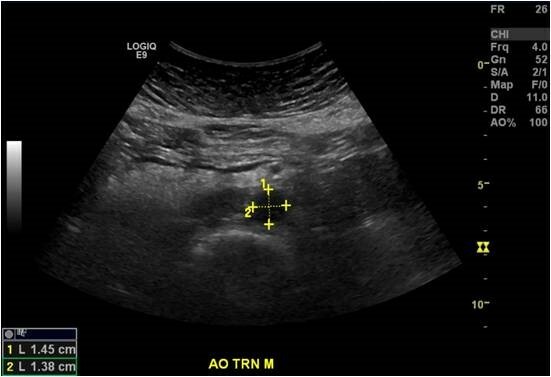 When the sonographer assesses the veins in the legs including the external iliac, common femoral, femoral, popliteal, gastrocnemius, posterior tibial, peroneal, greater saphenous and small saphenous veins. 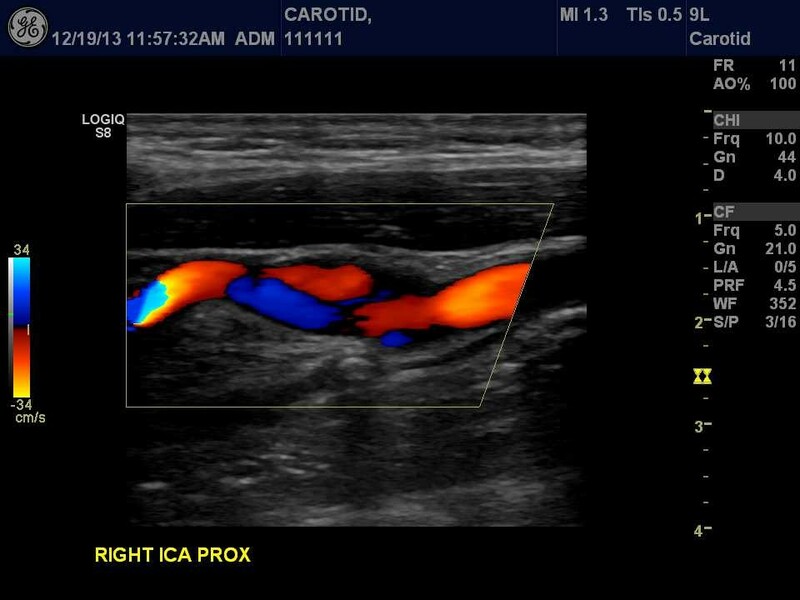 When the sonographer assesses blood flow in the acquired arteriovenous fistula or arteriovenous graft including inflow and outflow access sites. An abdominal aortic aneurysm (AAA) is when the wall of the aorta weakens and bulges out. Treatment of the aneurysm will depend on the size of the aneurysm. Medicare Part B will cover a one-time AAA screening ultrasound examination if you have a family history an AAA. You may also qualify if you are a male ages 65 - 75 years old and have smoked at least 100 cigarettes in your lifetime. An AAA is less common in women who have never smoked. Patients will need a referral from their doctor for this exam. The vascular laboratory also performs physiological examinations on patients to assess arterial blood flow in the extremities. Physiologic testing includes taking segmental blood pressures and acquiring arterial waveforms at various levels in the extremities and digits. In addition, photoplethysmography can also be performed on the digits using an infrared light to investigate small blood vessels under the skin surface. A common test performed in the vascular laboratory includes taking blood pressures in the arms and ankles and calculating the ratio between these pressures. This is called the ankle brachial index (ABI). A normal ABI is 0.95 - 1.3. 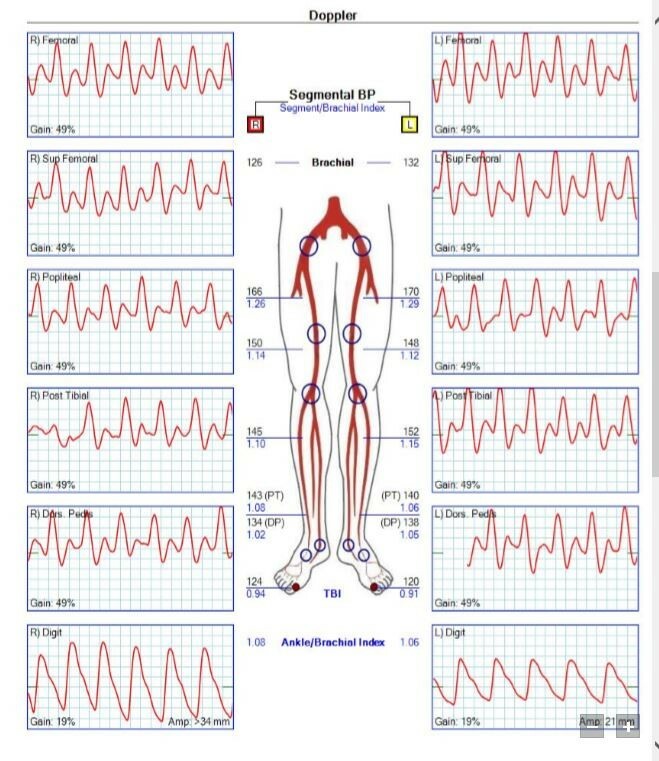 Combined with arterial waveforms, this is a powerful and frequently used test to identify PAD and its severity. 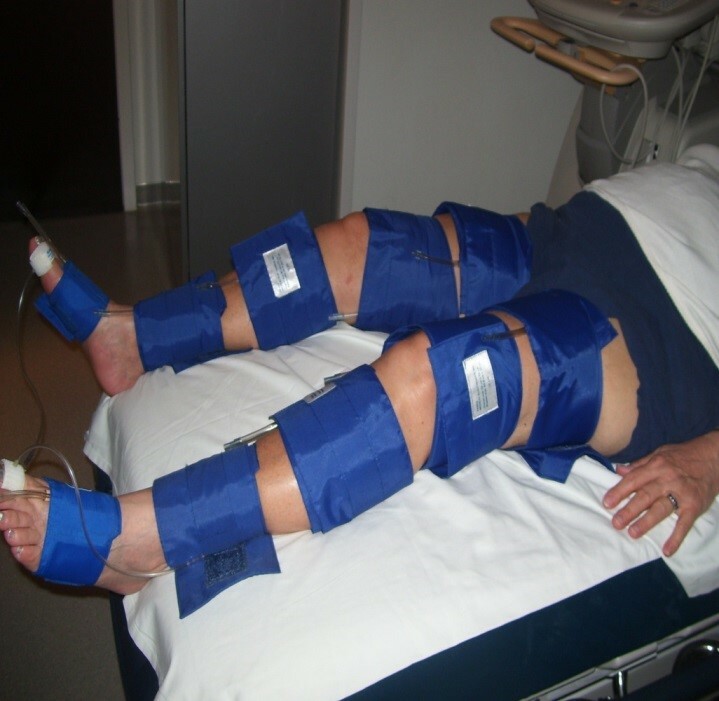 Blood pressure cuffs can also be applied to the thigh, calf, ankle, foot and fingers. Arterial waveform recordings and segmental blood pressures can be performed on the extremities to determine the location of blockages in the arteries. Physiologic exercise testing may also be performed which includes walking on a treadmill for five minutes or less at a comfortable speed and then taking blood pressures and arterial waveforms after exerting the muscles. This helps to identify whether symptoms are related to PAD. For exams of the arteries or veins in the abdomen such as aorta, inferior vena cava, mesenteric vessels, kidneys, liver or spleen, do not eat or drink for six to eight hours before the examination. Drinking water while taking medications is fine, but please don't drink coffee or smoke tobacco products prior to examination. This allows the technologist to best visualize the vessels and organs in the abdomen and provide more accurate results for your doctor. For peripheral arm or leg arteries and veins being tested, no preparation is needed. For exams of the arteries or veins in the neck, there is no preparation needed. For your comfort, wear a low collared shirt so the technologist can access your neck. Depending on the type of examination or test being performed, the sonographer may have you change into a gown and remove your jewelry or watch if necessary. While laying on your back, a trained vascular sonographer or technologist will perform the examination by applying a water-soluble gel to the skin and placing a transducer on your skin. Depending on the exam, the sonographer might ask you to reposition onto your side or stomach, hold your breath or perform a Valsalva maneuver (hold your breath while bearing down on your lower pelvic muscles). If the examination is a venous duplex checking for blood clots, the sonographer will apply pressure to the skin making sure the vein collapses. This may be uncomfortable, but the sonographer is performing the exam so your doctor can decide further action. The diagnostic testing may take 15 to 60 minutes to perform. Once the examination is complete, the images are sent to the interpreting physician, who will create a final report based on the findings of your exam and send the results to your physician.